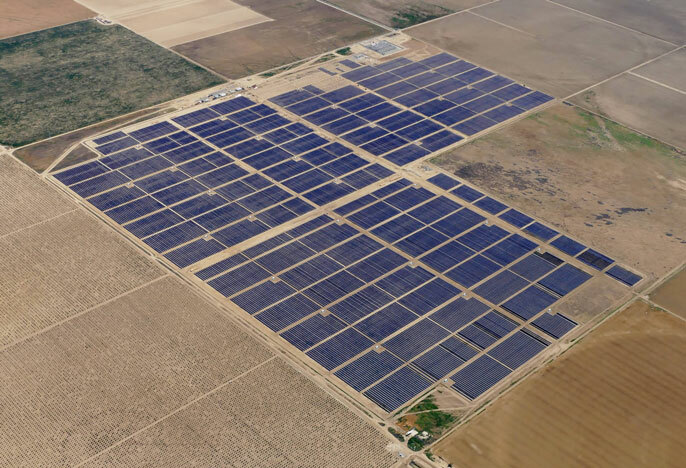 An aerial view of the Five Points Solar Farm in Fresno County. The farm, a 60-megawatt solar power installation built to supply renewable energy to the University of California, represents roughly 14 percent of the total UC system’s electricity usage, and is a key step toward the university’s goal of reaching carbon neutrality by 2025. Universities across the United States have set ambitious goals to shrink their carbon footprints, including the University of California, which launched its Carbon Neutrality Initiative in 2013, aiming for carbon neutrality by 2025. But amid broad support for climate action within the UC system, a big question looms: how to actually hit that target. Now, a 27-member team uniquely comprised of researchers, facilities managers, sustainability officers and students from across the UC campuses has released a report that helps answer this important “how” question. They present a feasible strategy to achieve a measure that would be especially game changing: replacing natural gas with climate-friendlier options. “Some decarbonization pathways are surprisingly economical,” said the report’s lead author Alan Meier, a senior scientist at Lawrence Berkeley National Laboratory (a US Department of Energy lab managed by the University of California) and adjunct professor at UC Davis. Like the state of California, UC campuses rely on highly efficient power plants that burn natural gas. Since natural gas accounts for two-thirds of the greenhouse gases emitted by all UC operations, phasing it out will be critical for a carbon-neutral future. The report’s three-step plan for weaning off natural gas entails aggressively increasing energy efficiency across all ten campuses and five medical centers; replacing natural gas with biogas in the short term; and in the long run, electrifying all end uses of energy and switching to only renewable sources. Solar panels on UC Merced’s Science and Engineering Building. Amplifying the report’s message is a paper published February 27th in Nature Climate Change, written by the report team, which urges the world to look to local institutions, such as the UC, for leadership in meeting carbon-reduction commitments established by the 2015 Paris Agreement. The team’s recommendations are widely applicable in the United States, given that the nation’s energy system is increasingly dependent on natural gas and will ultimately face similar challenges as it decarbonizes. An immediate priority for reducing the UC’s natural gas dependency is to use less of it. Already, the UC is on the leading edge of energy efficiency, and the report encourages a continued push toward “deep energy efficiency” by retrofitting more existing buildings and designing new buildings to be not only highly efficient but also all-electric, rather than reliant on gas-fueled systems. Deep efficiency would also mean cost savings, freeing up money to reinvest in further decarbonization measures. The report estimates that continuing to aggressively retrofit existing buildings at all campuses could capture an additional $19 million per year of net energy cost savings by 2025, on top of the $24 million per year the UC has already achieved over the past decade from its efficiency measures. “Economically, energy efficiency is a no brainer,” said project director David Auston, a senior fellow at the National Center for Ecological Analysis and Synthesis (NCEAS) and researcher at the Institute for Energy Efficiency, both of UC Santa Barbara. To wean campuses off of their remaining natural gas needs, the report assessed replacing it with biogas, or energy derived from organic materials such as food and agricultural waste, certain crops and biosolids from wastewater treatment plants. While chemically identical to natural gas, biogas is climate friendlier because it is renewable — the plants that produce the carbon burned for energy also consume atmospheric carbon. The report frames biogas as a stepping stone to carbon neutrality for the UC, rather than a long-term solution. Like its fossilized counterpart, biogas is mostly methane, a greenhouse gas, which means methane emissions from gas infrastructure would still be an issue. “We view biogas as an interim measure that buys us more time. Ultimately, it must be phased out and replaced by 100 percent electrification,” said Auston. Complete electrification will mean converting all university buildings and facilities to electricity powered by solar, wind and other renewable sources, a conversion that is already underway at some campuses. A full transformation could unfold with time and some technological leaps – for example, advancing the technology and adoption of renewable energy storage and equipping existing buildings with heat-transferring technologies, such as heat pumps, to reduce their reliance on central heating loops. So, can the UC achieve its goal of carbon neutrality by 2025? “The goal is achievable, but it may not happen the way people expect it to,” said Meier, alluding mainly to the temporary reliance on biogas to get campuses over the hump. It will also depend on what individual campuses do. Auston called their report a “broad-brush plan” that serves as a starting point to be individualized for each campus, and a lot will depend on the allocation of resources and willingness of campus leadership to take action. “We hope the report will generate a dialogue that will help people get their arms around these big questions,” said Auston. The report also illustrates the value of taking a ground-level and integrated approach to developing a carbon neutrality strategy, with its incorporation of both scientific analyses and the practicalities of implementation through the involvement of researchers and facilities staff. Independent from the UC’s Carbon Neutrality Initiative, the report and paper are part of the larger TomKat Carbon Neutrality Project to identify practical, bottom-up strategies for meeting the 2025 deadline. This effort was funded by the TomKat Foundation and the UC Office of the President and co-led by UC Santa Barbara’s National Center for Ecological Analysis and Synthesis (NCEAS) and the Institute for Energy Efficiency (IEE). Additional financial support for this report came from CITRIS and the Banatao Institute.